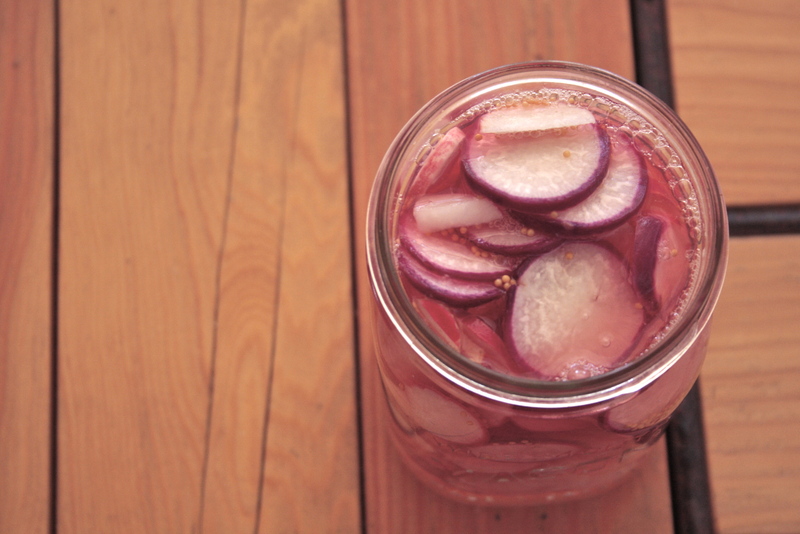 quick fridge pickled radish | eating with S.O.L.E. Oh this is the most exciting time of year in the garden, finally flush abundance in every corner! The strawberry are bursting, the first snow peas were picked today, radishes are erupting from the earth, and the carrots are screaming to be thinned! The odd blueberry is ripe enough to sneak a taste of, and the scapes have come and gone. There are only so many radishes one family can eat! I have dutifully added them to every daily salad, and opted to add them into our favorite hot and sour soup as a water-chestnut-ish addition. And today I decided to slice some up thin and make a easy refrigerator pickle with them., and they look lovely! I am sure they will be spicy and perfect to top tacos with! I just shot from the hip here, and I am sure we will all enjoy these results! Simmer over medium heat until combined, then pour into mason jar. Cool, cover and refrigerate… enjoy after the radishes have had a few days to soak up their pickle bath! These will keep well for a few weeks in the fridge. I definitely want to know how these turn out. Those radishes were spicy. I snacked on mine on my drive home.